Is the hand-print embossed or extruded (Convex or Concave)? I would like to know how you see it, so please place your opinion in comments, below. Thanks! As a kid I always found optical illusions to be fascinating. Do you know how this effect works? It is concave, i agree. But still very neat! it is sticking out of the sand but if you try you could sort of see it the other way. I see it as convex, like it is rising to the surface. it is extruding as witnessed by the shadows on the thumb and on the pinky side of the hand. IT is convex. Light source coming from the 3:30 position casting shadow on the thumb and 4 fingers. The slight shadow on the right of the hand is a slight depression before the palm rises. Looks like it is extruded to me. I’m not 100% though. the easiest way to tell it’s concave is to look at the shadows of the objects on the right side of the photograph. the shadows fall to the right, indicating that the source of light is on the left. if the shadows on the hand were on the right, the hand would be a positive structure instead of a negative structure. Yeah when you first look at it, it does look convex because of the shadow, but if you focus on the wrist, you can tell it’s concave. it is convex, because of the way the shadows fall, you can see the curve of the fingertips raised upwards,and the shadows fall away from the fingers.. Visual clues in the image suggest that it is convex, i.e. raised from the surface of the sand. Assuming this image was taking with a effective point light source (i.e. the sun), observe the shadow patterns on the small rises of sand to the left of the hand, and the dents in the sand to the right. These indicated that the point source is to the right of center of the picture, and below it, and that overall, the hand is raised, casting a leftward/upwards shadow. This is also consistent with the more rased base of the palm having a brighter lighting than the center of the palm (note the right to left/ south to north darkening gradient). I think it’s convex. If you see the shadow on the thumb, it looks like the sun is shining from the right of the picture. Also, look how the hand is curved upward (i.e. fingers higher than palm). You couldn’t make a concave handprint with your hand in that formation. Definitely concave. You don’t even need the wrist part at he bottom. It “sticks out” at you. It is both, I agree with “Chris” regarding the wrist, but the fingers are convex you can tell by the little holes in the sand near the right side of the image. If it were all concave the shadows of the fingers would be on the other side. I agree, its concave… I have a lamp that does the same thing… its of an egyptian pharoes head, and it lookos like it follows you around the room. its just the way the light is hitting it… the shadow parts where the light does not hit make it look the are protruding. Simple. It is and can only be extruded. i say convex (extruded). why? couple reasons. 1) space between the fingers: there is NO way sand could stay that rigid and be that thin if it was concave. 2) shadowing: the small specks all around are probbaly sticking up, not dipping in. the shadows of the specks seem to match the hand. My mind just cannot picture the hand entruding into the sand with the surrounding shadows as they are. It looks convex to me but I suspect that it it actually convex. My brain sees it as convex though. for me it is obviously convex. Also going for concave (extruding). This is based on how the shadows are cast both from the handprint and the small holes to the right of the picture. Its an imprint in the sand, look at the shaddows ont he Right Hand Side, these are above the sand. I believe it’s extruded, as when you look at natural embossed holes and marks down the right hand side, the shadows fall on the right. If the hand was also embossed then the sahdow would also be on the right, but there not. There on the left. Leading me to believe itsticking up. it really could be either, the last post is wrong as the wrist could have been done to make people think it was concave. i think it works coz the human eye believes a thing is extruded when the light falls from the top left. I agree with chris it is concave. I think it’s the shadows that gives it away. no it’s convex. you see how the shadow works in the holes to the right? shadows of the hand are in the oposite direction. it lookes like someone is burried and sticking their hand out from under the sand…. It is convex. I believe it was made by taking a plaster-of-paris cast and using it as a mold, then smoothing away sand from around the cast. Palm prints in the sand do not leave palmar creases, (and if they did they would be raised from the surface whilst all else was depressed). This a a faked image. It could be a palmar caste placed palm up in the sand (its at the level of the last tidal wave limit) which has been embedded and just washed over, its detail makes it unlikely to be an actual palm in situ. It could also have been cleverly sculpted. It takes very fine powder to pick up palmar creases such as plaster of paris. Essentially then its raised above the sand. For it to be concave/embossed/pressed into the sand, the sun must be coming from the left. For it to be convex/extruded/sticking out of the sand, the sun must be coming from the right. Reviewing shadows of other objects in the picture (not connected to the hand), indicates the sun is coming from the left. Also, there is a slight shadow just to the right of the wrist, which would be inconsistent with a sun-on-the-right, convex hand scenario. It would be consistent with the sun-on-the-left, concave hand case, however, if you account for the slight rise in sand around the edge of the hand, caused by the hand being pushed into the sand. It is concave. The stick on the right side of the picture has the shadow on the right, showing the sun is on the left side castng the shadow to the right side. the shadow on the hand is on the left side. The shadow is from the ridge from the hand being pushed in. Its not rocket surgery! The hand is extruded. The shadows of the hand do not match the intruded holes in the sand, to the right of the hand. Convex. shadows don’t make sense if it’s concave. Look at the shadows. I’m thinking convex. it looks like its convex, although it could be seen as concave, particuraly if you turn the picture upside down. what it really looks like is that someone partially buried a cpncrete hane in the sand. is it really convex, or concave? Convex…but sunk into the cement. The hand imprint itself is a convex feature, but the convex feature is sunk a bit into the cement, which explains the extra shadowing around the wrist. I’m not sure if everyone is using the same definition of concave/convex and embossed/extruded, and I’m not entirely clear anymore either, so I’ll use a different term. The hand is imprinted into the sand (or cement). As seahn (#13) mentioned the shadows on the right side give everything away, especially the little wood chip in the top right. They fall to the right, which means the light source is from the left. It really does look like it’s coming out of the sand though, and had the image been cropped it would be an even more convincing illusion. It’s just a picture. You’re all crazy. Go read a book or something. There is a blade grass sticking out of the sand(top right) casting a shadow down and to the right. This tells me the sun light is coming from top left. It is obviously a waffle. You can see it BOTH WAYS!!! If the sun is on the right the hand is extruded. It’s a hand pressed into the sand, then the photo is inverted making it appear convex. for me its clear convex… imposible to see it concave… uhummmm? It’s Extruding. Good Point Jetuser ^. Does’nt convex mean out as well as embossed and extruded?. And concave means in? It looks to me that the Hand is coming from the sand. “Out”. It’s actually BOTH! Concave and Convex! Look at the shadows on the surrounding twigs and blades of grass….The shadow casts to the 3:00 position indicating the light source to be at about the 9:00 position. Therefore, the shadowing on the fingers are there simply because they are very deep, Concave. The Palm of the hand however, gradually becomes convex left to right and stops just under the thumb, creating the shadow on the right side of the palm. Convex – am I right? Ha ha! I think it depends on where the light source is coming from. If the light source is on the left of the picture, it’s a hand print. If the light source is on the right, it’s extruded. Thats just my opinion but who knows? object. I myself have a hard time flipping my brain to see it as it actually is, which is an indentation in the sand. Look at the small debris to the right, white shells and sticks. They are casting shadows that show that the light is coming from the left of the picture, which would give you dark shadows on the left side of a depression in the sand. The interesting thing is that either a raised form or a sunken form will look the same, without other visual clues it would be nearly impossible to tell the difference. actually, it appears to be both. The very edges appear to cave in, and the hand itself extrudes out of the sand. Look at the edges on the left side of the hand. Then look at the edge of the thumb. Based on the comparison of angle angle and the shadows, it seems the hand does in fact extrude. I see it convex, even if I rotate it. I managed to see the stones on the edge as convex (first they appeared concave), but I never saw the hand concave, which is probably the “correct” version. I agree with cyberfunk and a number of others: based on the shadows in the sand to the right of the hand, as well as the hand itself, it is extruded. But how was it extruded?! I once read that these kind of things could be seen either way (extruded or embossed). That we are more used to see things with the light coming from the left, but if we just flip the image it automatically just turns the opposite. Strictly I suspect that there isn’t enough perceptual information to tell – there is no independent way of telling the light source. From one position a convex structure is indicated and from another its concave. Flatly lit stimuli with minimal external information like this generate an ambiguous image that can be perceived according to the viewer’s preference. Mine – its flat with black ‘shadows’ painted on it! have shadows that shwo the sunligth coming fromt he right side of the image. 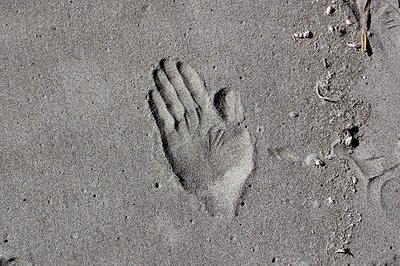 The hand, if it was printed into the sand, would show the same shadow patterns on the right side of the hand but it doesn’t. Instead the shadows appear ont he left side of the hand where the sun does not hit because of the raised handprint. I think it looks like someone placed their hand in the sand as they worked on the sand drawing on the right. It is concave. Notice in the upper right corner of the picture there is a stick protruding out of the sand. The shadow falls away at about 5:00 O’clock. Therefore, the only way for the hand shadows to occur as shown is for the hand print to be pushed into the sand. While trying to decide if this is concave or convex, I feel that its just flat. That someone did a damn good job using shading and highlights. I can see the hand in both ways but it is my opinion that the hand has been pushed in to the sand to form a dent. I think that the sun is at about 10 o’clock because of the small protusions (especially the twig like thing at the top) on the right that have shadows falling to their right. The shadows on the hand lie to the left indicating that it is a depression in the sand. It looks convex, but it is concave. One thing you can be sure sticks above the surface is brown stick in the upper-right corner. (Also the string-like thing a little lower and to the left of the stick) Those show that the light source is from the upper left (about 10 o’clock). So the things which protrude from the surface are bright at 10 o’clock and dark at 4 o’clock. And depressions are dark and 10 and bright at 4. So the hand is a depression. Why does it look like it’s raised? I think it’s because someone ran a directional embossing filter on the image. That would also account for the grainy effect and other odd artifacts in the picture. You can actually tell the print in concave because of other shadows in the picture. If you look off to the right, you notice rocks and a small piece of some grass or something, with shadows to the bottom left. From this we can assume the light source is from the top right. Therefore the shadows on the hand are going from a higher surface on the left, to a lower one on the right. It’s convex. There wouldn’t be shadows on the inside of the print if it were concave. But, at the same time, you can look at it as being both. The wrist is raised, whereas, the palm and fingers are sunken in. But, it’s definately nore convex than anything else. If the image looks convex to you just imagine the light source coming from the opposite direction (180 degrees). You can achieve the same effect when looking at pictures of moon craters. we can keep guessing what it is.. why dont u tell us whos right? It’s concave, pushed in, like movie stars do in front of the Mann Chinese Theater in Hollwood. The sun is on the left. You can tell by the shadow on the pebbles and the stick to the right of the handprint. This is obviously extruded. You can clearly see it’s showdow on the left side of the print. The thumb also casts a small shadow. If you examine the rest of the picture you can also see that the other smaller shadows are facing the same direction…..
I’ve been studying the image again, and noone has yet mentioned the shadow cast by the “straw” in the upper right-hand corner of the image: it’s definitely from the “north-northwest”. yet, objects in the center-lower right area seem to be shawowed from the “west”. I think the whole thing is a fabrication, not a “natural” photo at all! i think that it is contruded. it is a mix of both worlds. Post some new illusions man. Its been so long. and do post this!!!!!!! The hand is going in (=convex). On the upper right there is a small wooden thing coming out of the sand. It’s shadow is to the right, indicating that the light comes from the left. Looking at the stick in the upper right, it would appear that the light is coming from the left. This makes me believe it’s convex. it looks convex. if it’s concave, it’s great work by the illusionist. It’s convex. If you see the little holes on the right of the picture, you can see their shadows to the left, which means that the sun is coming from the right! And if you see the hand, it also has shadows on its left side! It’s coming out of the sand! Case solved! See the tiny bit of wood, top right corner? Its shadow goes to the right… So the hand can’t be convex. I would have to go with concave, it seems as if the back of the hand is being imprinted in the sand. Convex in my sight, Extruded. I don’t see any way to see it as Concave unless you look at it and think the finger tips are laying in shadow rather than the shadows laying past them. Your brain tends to put light sources that cannot be directly seen on the top-right of a photo. Because the light source here is actually on the left (look at the shadow off the little piece of drift wood near the top right corner of the photo), your mind misinterpets the shadows. This may be easier to see if you rotate the photo 180 degrees. its concave. much like the einstein face illusion. It’s convex. From observing the small holes in the ground to the right it can be observeed that the light source also lies to the right. If it was concave then there would not be the dark shadow at the pinky finger side of the hand. From that observation it has to be convex, withstanding that there was no graphic editing(photoshop) involved or that the shodows are real and aren’t coloured in to fool the viewer. The handprint is a depression. you can look at the items on the right and their shadows are cast to the right. The reason so many people think otherwise is because when the print was made, some sand was forces upward around the edge of the print, and as for the shiny part around the heel of the palm that is from the sand being particularly smooth. in my opinion, its got to be convex. like somebody else said, when pressing in a handprint into the sand, you don’t get such details as the palm lines. also, take a look at the shadows to the right… in all of them, there is a big difference between the sun and shade. most of the posts that i’ve read above state that the shadows are on the right, thus the sun must be on the left and the hand is thus concave… however, this makes the assumption that all the little things to the right are themselves convex and thus would cast a shadow to the right with the sun on the left. However, if you think about it and look at the picture, it seems to me that all the shadows are being cast from concave holes rather than convex piles. There are several reasons that I believe this to be true: 1: This is at the beech… small round holes always occur, whether it be from people poking sticks, or rocks being moved. 2:Go to the beech yourself, and make a small hole in the ground and a small pile of sand. Then look at the shadows. With the hole, you’ll get a sharp contrast between shadow and light. With the pile, not so much. Since the surrounding sand is bright, even on the “dark side”, light gets reflected back, and for a pile, hits the dark side, thus making the shadows seem not as dark. For a hole, however, light does not get reflected into the shadow, since there is no line of sight with the other “bright sand”. You can also see a very sharp edge to the shadow line… this highly suggests them being holes in the ground, as if it was a raised pile, there wouldn’t be a sharp shadow line but rather a gradual gradiant as the pile fell back down on the far side, unless one side of the pile had a cliff. In which case, every little pile in the picture would need a cliff on the right side for the shadow to look like this. With a hole, however, you do get this sharp shadow line, as thats the point where, on one side of the line, light gets blocked by the lip of the hole coming down at an angle, and on the other side, light just above the lip goes into the hole. Now, if you’re following what i’ve said above and agree with me that they’re holes on the right, then for the shadow to be on the right side, the sun has to be coming from the right side, as the lip causing the shade is closer to the sun than the shade is. Thus, since shadows on the hand are on the left of it rather than the right, this means the hand must be convex, sticking out of the sand. Now if we assume that the hand is sticking out of the sand, lets confirm it. The shadows falling off the left of the hand do appear to be slightly lighter than the darker holes on the right of the image. This is supportive of the reflection part I stated above. Also, there is more of a gradient to the right side of the shadows, as would be expected from a rounded object sticking out with the sun at an angle. and looking at the bottom right part of the hand (the pad area below the thumb), we can see that it is brighter than the rest, because if the sun was on the right as we assumed, it would receive the most direct sunlight out of any part of the hand. Perhaps we are seeing the negative. I see it as Convex. But, that’s me. compare the hand’s shadow with the other shadows on the sand. i’ve seen an illusion like this before. it’s cocave but looks convex because of the position of the light and stuff like that. compare it to the other shadows in the picture. wow pretty cool. but the stuff on the right….those are holes they dont have shadows, the light is coming from the right side and the shadow on the hand is on the left for people who said you can tell by the shadows on the stuff at the right. ha. i win! this sux… i have a headache trying to figure out what it look like, so i really dont know!!!!!!!!!!!!!!!!!!!! Either it’s concave and an easy thing to do, or convex and an amazing sculpture. After careful study I will settle this once and for all. the little yellowish stick in the upper right hand corner of the image clearly has it’s shadow falling to the right, so the sun is absolutly coming from the left side of the image. Therefor the hand is concave, an impression pressed down into the sand. Look closely at the picture and you’ll see that there are many small bumps of sand whose shadows are all to the left, the same as the handprint, indicating that the handprint is a “bump”. Also look at the holes in the right side of the picture. Their shadows are to the right, the opposite of the handprint. So the hand can’t be a hole. Look at the lines between the fingers. That would be almost impossible to reproduce in a concave print. Do you remember when you stand at the water’s edge at the beach, and when the waves come they wash away some of the sand around your feet, but not the sand that you’re actually standing on? It leaves a convex print of your foot. The sn would be almost directly overhead, which would mean that small things have shadows that are a bit different from bigger and wider things like this print. jetuser you sound like a know it all,but i have no idea witch is witch,so i would say it is coming out(i think that is concave). It’s a concave image flipped. Alright, the whole point of illusions like these is to see if your brain can perceive BOTH concave and convex. Therefore, the hand is both, it is just a matter of how your brain percieves it. It’s basic Psychology. I know it is concave only because I know this trick. It defenatly apears to be convex. At first, I could only see it as an imprint. After re-focusing, it looks as if it is embossed. This is amazing! it looks convex but maybe it is just a good illusion and it’s actually concave… anyway, that’s not important. what really matters is that quite a few people here clearly do not know the difference between concave and convex. you have the internet. look it up!!! It is definately coming OUT of the sand, I am 100% sure. Look to the right of the picture, the pock marks in the sand have shadow on the right, and light on the left.If the light is coming from the right hand side, then the right side of the CONVEX hand will be light, and the left side of the CONCAVE dips will be light, as they are. haha i can see both. If you move your head to the left edge of your screen and look at the hand. Imagine the dark parts are sticking out and viola! Okay listen people as was previously said it can only be extruded (concave) (into the sand) because of the direction of the light shadow on the other bumps and textures in the picture. Look very carefully at the right side textures in the sand and apply the same light direction to the image in question and you can see the sources of light don’t match, as the bumps were not a part of the illusion but merely there already they would show the truth shadowing. I don’t normally post on the net never can be bothered but looking at all your comments compelled me to comment. I’m right I’m a Leo. I did not understand anything that you just said! Could you explain it in human simple english form! yes, you can definetly tell that it is concave. still a neat illusion but if you look at the wrist then it is easily defined as concave. also you can see the shadow at the hand part. it is concave beacause of the wrist part at the bottom, and you can also tell because there is seashells beside the hand print and it looks like it’s on the beach. i think that it is both. it is engraved around the edge and embossed in the middle. at first it looks like it’s protruding out of the sand, but then you look again and realize how it’s done: it really IS an imprint. GREAT trick of the light, though. I think some of the people leaving comments here don’t know the difference between convex and concave. It appears to be in da sand at first… but as you look at da other grooves in da sand their shadows are going da opposite way. but it could also be a photoshopped pic or it is a cleverly done imprint….. It appears convex to me. *big sigh to people who make the effort to spell photoshopped correctly, but not “the”. ugh. I hate when people don’t speek English in their comments. Are they trying to be clever or are they really that illiterate? As for the photo, I think the hand is extruded. Excellent illusion. P.P.S…. i hav this reali cool illusion but i don’t know how to send it!!!! :( plz plz plz can u say it in some way????? and i’m telling u if u accept it its NOT PHOTOSHOPPED!!!!!!!!!!! This is concave. Look at the shadows of the rocks on the right. The shadows are on teh right. But if the hand was convex, why are it’s shadows on the left? It’s concave. There is no way to tell. Although it is a bit more ikely that it is a hill. To the right you see what appears to be either small craters OR small hills. It is likely that they are craters therefore if their shadows are on the right the sun is on the right. The shadows on the hand are to the left so it must be a hill. What???????????????????????????????????????? LOL. I feel so dumb listning to all of your comments people! My thoughts are that this was mapped to purposely appear like this. It is technically impossible to sole the answer. My opinion is that it is beveled into the sand because of how the lighting works with the “dry” material. It is most likely concrete sand. Or photoshop? There is something odd about the shadows in this image, which make it difficult to determine whether the hand is convex or concave. The most recognizable shadow on the right is that of a stick. There, the light source is obviously to the left. The same is true of all the pebbles on the far right. If we interpret the entire image by these shadows, then the hand is concave. However, all pebbles left of the right-side line of the palm have shadows on the left, which means the light source is to the right. If these shadows indicate the correct direction of the light, then the hand is convex. I’m guessing there is some digital trickery here. That is, it appears to me that two photos were taken, the light source for each placed in opposing directions. And the two images have been spliced together. There is no natural way to accomplish this image. Its an imprint, ie the hand is pressed into the wet sand. My friend took a photo of his footprints on the beach a few years back and got exactly the same result as this. As you looked at the set of footprints you could not work out whether it was impressed or pushed out of the sand. It is all to do with the angle and direction of the sunlight, but they look great. Actually, you are all wrong! I’ve found the other picture of this on google images! It shows from a different angle that it is most deffinately convex. Really good illusion though! I love these! It can’t be sticking up, there would be a shadow! Besides, the wrist and index finger just SCREAM missing sand. im guessing but they pushed their hands in the sand and then carved around it to make it look like it was convex. Again, just a guess. i can see both too…i could only firs see it as a covex, but then if you can imagine in your mind the way shadows work then you’ll be able to work out the cocave as well…i think this is meant to be a concave for obvious reason….you can do an imprint of a hand on sand that’s a convex…..
Ok, I have to jump in and ruin everyone’s fun. This is NOT a trick of the light. The hand is concave, but it’s the shape of a hand, which your brain recognises as a convex shape. Your eyes clearly see sand with a hand imprint in it, while your brain applies meaning to that image; in this case it recognises a hand, so it tries to ‘correct’ your eyes by telling you it’s convex. What you see after this point depends on how you resolve it mentally, but if you have average mental acuity then your brain should resolve this picture to what it actually is, i.e. a handprint in the sand. Once it has done this, it becomes very difficult to trick your brain into seeing the original image again. Optical Illusions of this type are are often used when describing hypothetical situations for Artificial Intelligences. I can’t remember what this phenomenon is called, however. I say “concave” because of the detail in the middle of the hand seems that it was pushed down, although I do perceive it both ways. I bet steph does not even know what convex or concave is, boy i really hate smart alecs! Ok thats my rant but, i totally love this site, and i have gone on every day so…….im trying to finish going through all the categories….. i love illusions! and i would loove to design a logo for this site if they have not got a new one yet…… BYE! Convex. The way I see it the light is coming from the bottom right of the picture. The right side has dents in the sand (concave) Which makes the shading correct for everything. is it just me, or are the “shadows” cast in this supposed trick-of-light/concave-convex-brain-misinterpretation inconsistent with the shadows made by the sand imprints of the surrounding objects? It is a two dimensional IMAGE of a hand print that could be either concave or convex. We can never know for certain whether the original hand print is concave or convex from this IMAGE, since that would require this to be replaced with a 3 dimensional image. We could construct either one that would look identical to this image. I want to say…. no rather not for “steph” will shake his head and laugh …. fokken engelsman….. Probably it’s just the way the sun was facing. It is very obviously extruded. Look at the two holes that are to the right of the hand. The shadowed part of the holes is the inside right half. That means that the light is coming from the right. Conversely, the shadows of the hand are on the left side and outside of the hand, which means it’s extruded, thus casting its shadow to the left. It’s impossible for the hand to be embossed and to cast a shadow outside of its delineation. in the holes in right side of the picture shadow is in right but on hand print shadow is in left if was embossed shadow most was in right side like the holes.and allways embossed shadow is sharper than the extruded shadow coz of indirect illumination. It works because, in a picture, it is impossible for your brain to differentiate which side the shadow is coming from. Is the sun on the left casting shadows on the protruded outside or on the right casting shadows on the walls on the inside. Now logically with deductive reasoning we can determine that it is PROTRUDING from the surface. We do this by looking at the divots off to the right and since those shadows are sharper and more clear they are CONCAVED since indirect illumination causes this effect. If they are concaved the hand must be protruding since the shadows are on opposite sides. I only see one. I can only the convex not the concave. I see a face does anyone else? @Guy… I see the face on the right with shaggy hair. It’s concave, pressed into the sand. In the upper right of the photograph there is a stick poking out from the sand. The shadow it casts is below and to the right, suggesting that the light source is coming from the upper left of the image. Considering this, the only way there could be a shadow on the left edge of the hand shape is if it was pressed into the sand. The small objects on the right hand side of the image are pebbles or little lumps of sand, the objects on the left are divots or holes in the sand.